The perfect romantic or family getaway. 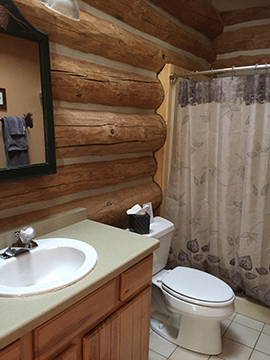 This lovely log cabin spot is cozy and quiet, but located minutes from the waterfront village of Egg Harbor. 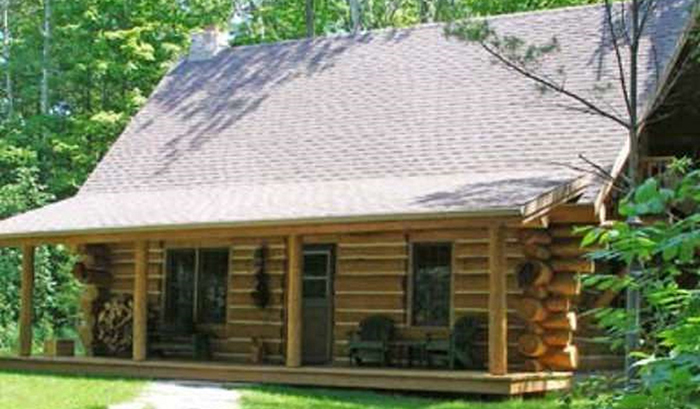 Nestled in the woods, you will think you are miles from anyone else but you can still enjoy all the theater, arts, shopping, outdoor sports and great festivals of Door County without any travel time. 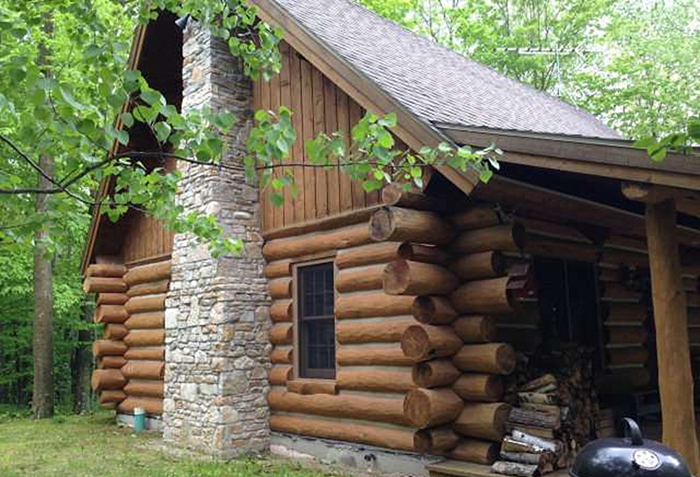 This authentic full log cabin, has a local stone wood burning fireplace, fire pit, Weber grill and sleeps 4. (We are not able to provide firewood.) 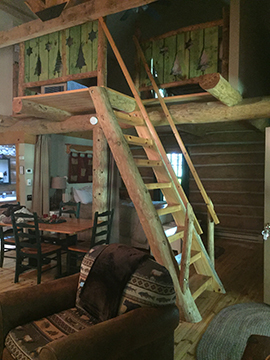 There is a sleeping alcove right off the living room with queen sized bed, and an open sleeping loft with two twin beds, accessed by using the simple wooden ladder. Huge front porch perfect for enjoying that morning cup of coffee or evening glass of wine. Two minutes from Stonehedge golf course and shopping/marina. Open all year! Heated and air conditioned. 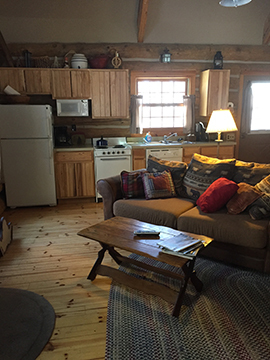 2019 Rates: $195 off season, $260 peak season. 2 night minimum. 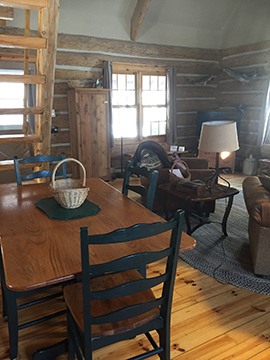 The cabin consists of a natural log great room finished with a hardwood floor and welcoming rugs, with sleeping alcove on the first floor. 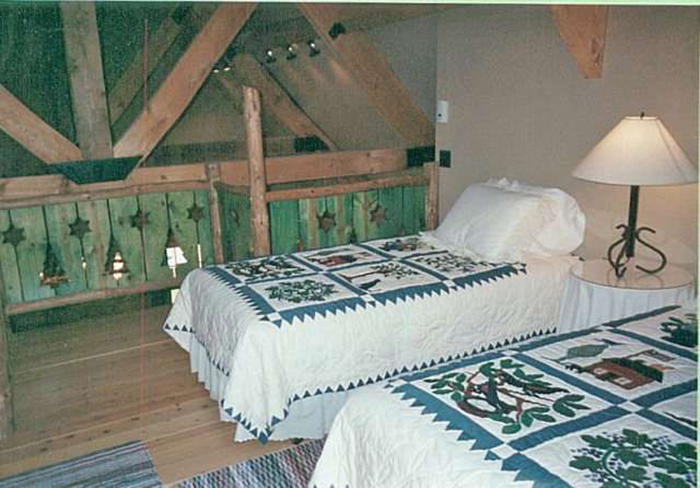 There in the alcove is a comfy queen sized bed with quality sheets and bedding. 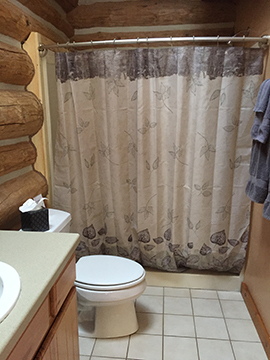 There is a full bathroom with walk in shower, complete kitchen with dishwasher and full sized appliances and living area with wood burning fireplace. 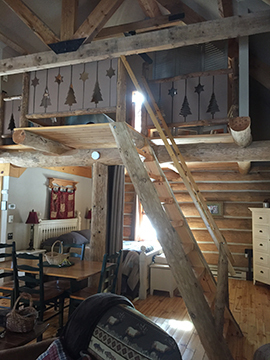 The stairs lead to a loft area with private deck with twin beds. The loft is accessed by a rather steep, open ladder with handrails that is perfectly safe but is not suitable for small children or for people with mobility issues. 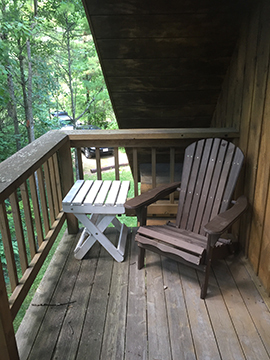 Amenities include large firepit outdoors, generous front porch for enjoying the night air, completely wooded 1.5 acre property, television with dvd player and internet/wifi and cable TV. Time and quiet are what you have here. 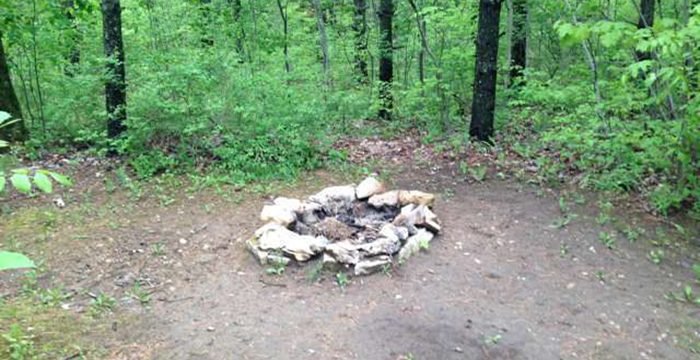 In the evening, cook your dinner on our gas grill and enjoy roasting marshmallows at the generous fire pit. We provide two kayaks (Wilderness Systems Pungo 120s) for your private use, kept at Harbor Fish Market & Grille in Baileys Harbor (10 minutes from the cabin) right on the bay with easy access and entry into the water. 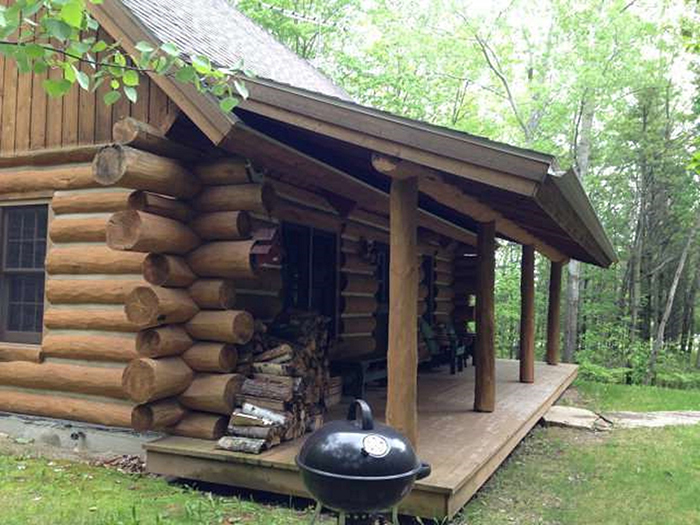 There are also two bicycles kept at the cabin for your private use and enjoyment. Complimentary wifi will keep you connected -- if you decide to check in! 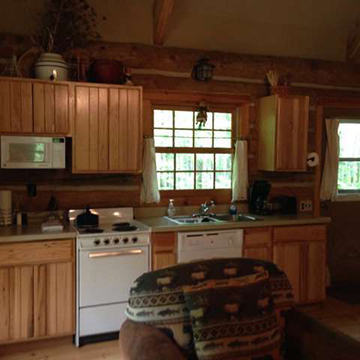 The kitchen is fully equipped with everything needed to cook at home - including stove, full sized refrigerator, toaster, coffee maker, microwave, basic condiments and all the cooking and serving dishware you will need. There is an ironing board and iron for your use. You’re only one mile from downtown Baileys Harbor where you have access to shopping, coffee shops, Door County Brewing, restaurants and the sandy shores of Lake Michigan. Harbor Fish Market & Grille is located right on the water downtown Baileys Harbor and serves breakfast, lunch and dinner seven days a week May-October, with weekend hours April, November and December. Check the website for open hours, reservations and information re: the hugely popular New England Lobster Boil. (www.harborfishmarket-grille.com) Custard’s Last Stan is open summers and is located next to Harbor Fish Market & Grille and serves fresh frozen custard, specialty coffees (cappuccinos, espressos, Chai Tea, etc.) plus they have freshly baked goods (including homemade Door County Cherry pies, muffins, cookies, etc.) and they make sub sandwiches made to order for those picnic type days. 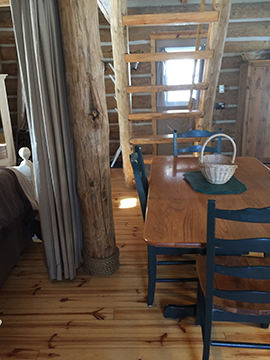 The cabin is available year round and is located near snow shoe trails, cross country skiing areas and many restaurants that are open all year. 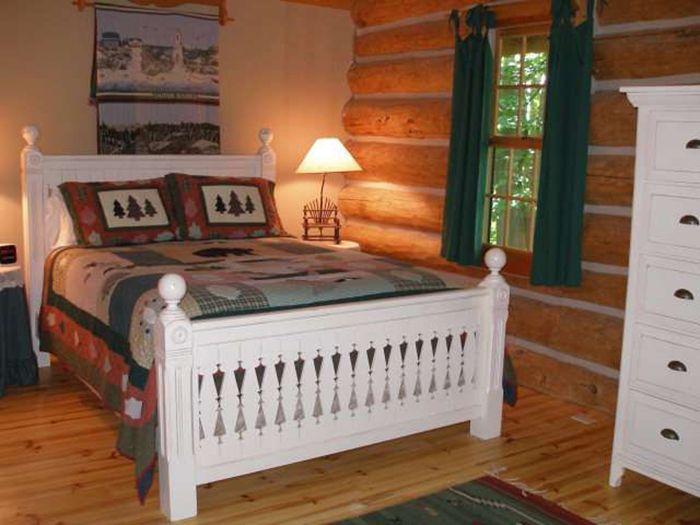 Egg Harbor is ten minutes from Fish Creek and Baileys Harbor and 20 minutes from Sister Bay.